Articles about travel in Ireland by Caddie Tours of Vienna, Virginia. After my life's greatest passion, my grandchildren, sits a three-way tie for "second-place:" river cruising, Europe, and Christmas markets. How better to embrace those three foci than to sail on one of Europe's storied rivers to medieval towns that celebrate the Christmas season with market festivals featuring native crafts, local food, beer and gluhwein, and activities ranging from live music performances to amusement rides? For the past six years, I have experienced Christmas markets both by land as well as by sailing along Europe's great waterways. Two years, in fits of unbridled enthusiasm, I did both. Once I went to London for three days at Hyde Park's Winter Wonderland, returned home for three days, and then was off again on a Christmas markets river cruise. Another year, I sailed along the Main-Danube canal and spent three days hitting up Vienna's multiple markets. 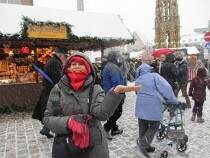 If you want to enjoy a Christmas-markets cruise, however, you need to move quickly. Why You Need to Book Now It is important to book as early as possible since the dates and itineraries for Christmas market sailings are dictated by the Advent season and are limited to those destinations that have large marketplaces. That means that sailings are limited, as is cabin availability. I have two late-November sailings along the Rhine booked for this fall, both of which I am "hosting" and they are arranged so I am home for Thanksgiving. A wine-themed cruise is the first, the second sails along the Rhine to Christmas markets in quaint medieval towns with beautiful Christmas-market squares. I booked both of these cruises in 2013 to ensure I got the cabin category I wanted. Although I booked far ahead, for most people this is the very best time to make holiday-season reservations - but you must hurry since deals expire in just a few days. For example, AMA Waterways is currently running one of the most generous promotional offers in the river cruise industry. Book and deposit $400 per passenger by June 30 and receive up to 40% off brochure prices, or take advantage of a waiver of the single supplement if you're a solo traveler. Uniworld also has a promotion - it's offering passengers up to $900 off per couple on selected itineraries - which, like AMA's, expires on June 30. Other Christmas cruise deals, if they materialize, may not be as lucrative. Why A Christmas Markets Cruise It is such a surreal feeling to wake up on a small ship gliding down a winding river and look out at a gently-falling snow blanketing the woods. Then you round a bend and fairytale houses or castles appear. What I delight in most, however, is docking in the heart of medieval towns and walking from the ship to the "old town." There is an ease and a convenience of not being tethered to buses to get you to your destination. I always feel as if I am "on my own," choosing whether I will walk along with the tour or wander by myself. During the holiday season, ships sailing to Christmas market destinations are festively decked-out. Sometimes, a decorated tree sits in the reception area or lounge. 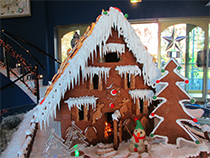 Occasionally, a gingerbread house, surrounded by seasonal sweets, is laid out at the main door. There might be a Christmas party with musicians onboard or a party with a passenger sing-along. On more than one occasion, Santa has surprised partiers. And I don't recall any Christmas markets river cruise in which a little "gift" from Santa or his elves had not been left in the cabin. 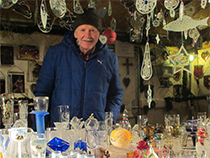 My Favorite Christmas Markets Holiday market cruise itineraries are qualified, so-to-speak, to favor cities with a centuries-old market tradition. If it is identified as a holiday-market sailing, you are assured of magical excursions. I have my personal preferences but they are not typically the most famous of Christmas markets, either. Vienna has about seven popular markets, including one at Prater Amusement Park and another at Schönbrunn Palace. 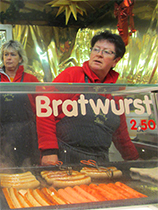 My favorite Vienna market, though, is the main market, the one on the grounds of Vienna's Rathaus, the town Hall. I don't think I've ever walked more than about 40 feet before buying another Glühwein, since the stands are that plentiful. I've collected more than 50 logo Glühwein mugs over the years . 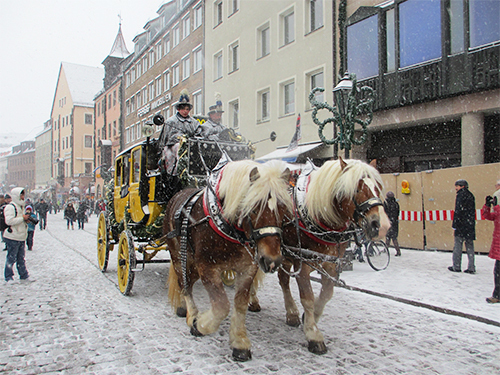 Nuremberg's Christmas market, anchored by a massive tannenbaum and a Gothic cathedral, is probably the most renown in Germany, the country in which so many of the season's traditions started. 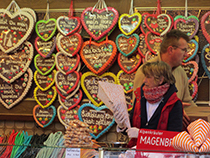 I find the Nuremberg market to be more expensive compared to others in Germany; even the internationally known Nuremberg lebkuchen is more expensive in Nuremberg than in other towns. I love the markets in Bamberg and Regensburg where their "platz" are hugged by narrow, picturesque alleyways. While Bamberg is known for its smoked beer (yes, you read that correctly), Regensburg is known for a German food-favorite, sausages (in fact, the oldest sausage kitchen in Germany sits near the river-cruise ship dock). To me, it's more fun, however, to buy sausages from one of the many restaurants around town that feature sausage platters and beer made on-site. 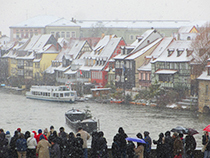 There's a river cruise itinerary for every taste and interest and a Christmas markets river cruise for anyone who loves the holiday season, particularly the occasional snowfall. There is no vacation I look forward to more than I do the holiday sailings in Europe. I embark with goose bumps and a sense of anticipation. Each time I pass the complimentary lebkuchen selection onboard, I take a few for my cabin. And, while others fall asleep with visions of sugarplums in their heads, I fall asleep with visions of awakening to a white winter wonderland. For more information on our River Cruise packages, see our Cruise page.